Pre-order DOMINION RISING for 99-Cents and enter a Massive Reader Giveaway! An exciting opportunity here everyone! DOMINION RISING is a box set of 22 sci-fi and fantasy reads from a host of bestselling authors and you can pre-order it now for only $0.99. That’s right. 99 cents and you get 22 original novels. I don’t know how anybody could pass up that deal! Oh and if you follow the link below, you can enter a massive reader giveaway that includes the chance to win an ipad mini, 20 books, and more. Find the Science Fiction and Fantasy reads you’ve been craving! 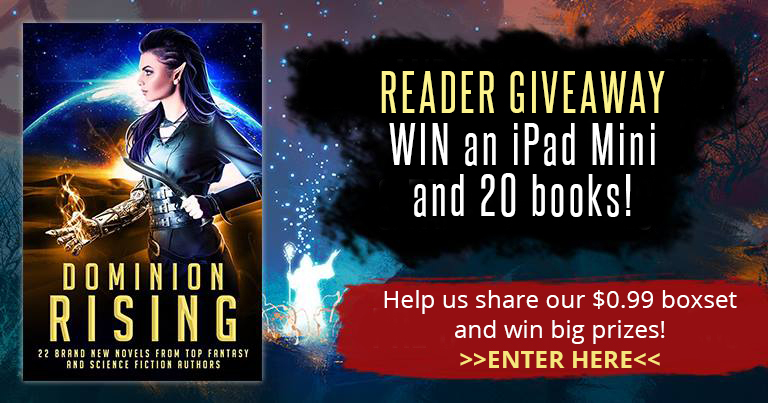 Whether it’s alien invasion or dark fairytales, heart-pounding galactic adventures or cyberpunk romance, Dominion Rising will satisfy with a thrilling mix of 22 BRAND NEW FULL LENGTH novels set in fantastical realms. Sword and sorcery, far-flung galactic empires, alternative history, epic magic, slipstream futures: this collection of carefully selected, exclusive novels is sure to please and delight readers of speculative fiction. Over five thousand pages packed with aliens, faeries, vampires, gargoyles, warriors, telepaths, space pirates, starship captains, hapless mercenaries, street urchins, robots, cyber-enhanced humans, badass heroines, and lost princesses. This award-winning, New York Times, USA Today and International bestselling authors have left no stone in the science fiction and epic fantasy universe unturned to bring you the very best escape from planet Earth.